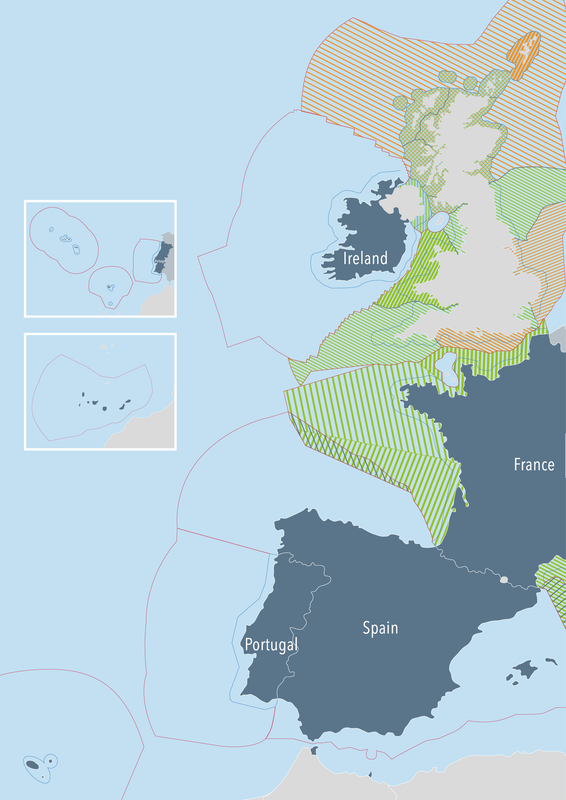 The European (North East) Atlantic borders the five Member States of the UK, Ireland, France, Spain and Portugal, covering a vast area and a diverse range of ecosystems. More broadly, these ecosystems are split into the Celtic Seas, Bay of Biscay and Iberian Coast. Given the size of this region, there are great variations in physical and biological conditions. To the north, the Celtic Seas are characterised by relatively shallow waters and a gently sloping continental shelf. Along the coastline are several sea lochs, brackish estuarine systems and maerl beds that support coldwater fish species, seabirds and cetaceans such as dolphins and basking shark. In contrast the waters of the Bay of Biscay and Iberian peninsula drop away steeply to a depth of over 5000m and support a wide range of cold water corals, sponges and pelagic species. In terms of sea uses, fishing is a major sector within the Atlantic, whilst coastal tourism and shipping are of great importance to all Member States bordering this area. In particular, the Gibraltar Strait and the English Channel act as major shipping gateways connecting Europe with the wider world. Whilst there is limited oil and gas production in the European Atlantic, this region has high potential for the development of offshore renewable energy given its favourable physical and climatic conditions for wind, tidal and wave energy devices. The nations bordering the European Atlantic region are developing MSP to fulfil their requirements under the EU Directive for MSP, to deliver maritime spatial planning by March 2021. The following MSP activity is under way. Ireland has set out its vision, high-level goals, and key actions to enable its marine potential to be realised (see Harnessing Our Ocean Wealth). The MSP Directive has been transposed into Irish Law and the competent authority for MSP is the Minister for Housing, Planning, Community and Local Government. Portugal has approved legislation for MSP for all Portuguese maritime space, following the MSP study Planning and Ordering of Maritime Space, published in 2012. It has now begun development of the Situation Plan, the Portuguese MSP Plan and has determined the competent authorities for preparation and support of the process. Spain has adopted legislation establishing a framework for MSP, and has created the Inter-Ministerial Commission on Marine Strategies. Competencies on maritime and coastal affairs are shared between central and regional governments, including those facing the Atlantic. The United Kingdom has established legislation and a policy framework for the preparation of UK marine plans, which is the responsibility of the respective governments within the UK. In England, the Marine Management Organisation is preparing the first set of marine plans for English waters including 3 Atlantic plan areas. In Northern Ireland, the Department for Agriculture, Environment and Rural Affairs is currently developing the Marine Plan for Northern Ireland. In Scotland, Marine Scotland has prepared the Sottish National Marine Plan, to be supplemented by Regional Marine Plans prepared by Marine Planning Partnerships, of which 6 will be in the Atlantic. In Wales, the Welsh Government is preparing the Welsh National Marine Plan. The OSPAR Commission was established in 1992 as the mechanism for governments to cooperate on implementation of the Convention for the Protection of the Marine Environment of the North East Atlantic. OSPAR works on a number of fields including biodiversity and ecosystems, hazardous and radioactive substances, human activities and offshore industries. For the European Atlantic area, MSP is still in its infancy and as a result cooperation between Member States has been limited. In the north eastern Atlantic, formal structures such as the British Irish Council have conducted high level meetings on MSP, however further cooperation has been restricted to participation in a small number of projects, such as TPEA (Transboundary Planning in the European Atlantic) and the newly established SIMCelt (Supporting Implementation of Maritime Spatial Planning in the Celtic Seas) project. The British-Irish Council was established in 1998 to promote positive relationships between the people of the British Isles (8 administrations including England, Scotland, Wales, Northern Ireland, the Isle of Man, Ireland, Guernsey and Jersey) and provide a forum for consultation and cooperation. The BIC operates at a high level, with annual meetings of heads of government and sectoral (ministerial and official) level. The work of the BIC is split across different priority areas of work, including the environment (which includes marine), collaborative spatial planning and energy. The Atlantic Arc Commission is one of the Conference of Peripheral Maritime Region’s 6 geographical Commissions and contains members comprised of local and regional authorities from the UK, Ireland, northern Spain, Portugal and France. CAAC is a network of territorial cooperation, based on the particular identity and challenges of Atlantic Cities. It facilitates cooperation among its members and with other actors, creating awareness in the European institutions about issues concerning the Atlantic Cities.